The Northern Territory Government continues to invest in expanding regional services by establishing an intra-town bus service in Wadeye. The service commenced in June and will have social benefits for Wadeye including improved access to youth facilities like the pool and sport and recreation centre, greater participation in community meetings and events as well as improved access to social services, job training and employment. The service circulates around Wadeye up to seven times a day stopping at all major camps and community venues. These venues will include the community store, youth centre, barge landing, health clinic and the airport. The first run of the Wadeye Public Transport Service starts at 7.15am and finishes at 4pm. Tickets are $2. No school-aged children are allowed to travel on the bus during school hours. 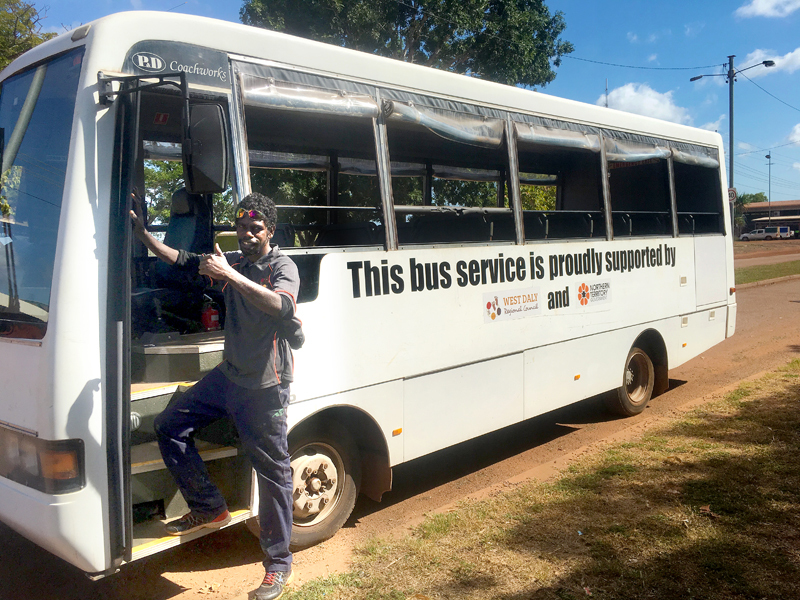 The West Daly Regional Council has received $216 200 in funding over three years from the Wadeye Community Activity Grant Program, with $92 100 provided in 2015-16 to purchase a bus and establish the service and $62 100 for the following two years of operational costs. The service is providing full time employment for one local driver and casual drivers will also be employed.